have enjoyed the sneak peaks in my last post. It is now time to reveal the first of the projects in full. For this creation have used the sweet sentiments collection by graphic 45. This range of papers is very pretty and the colours are so feminine. I decided to make a hexagonal shaped jewellery box. quite a few flowers but I love to embellish my projects. The accent inking was achieved using Distress Ink : Pumice Stone. of the paper collection. The braid and accent pearls give a slight lift to the overall project. pulls that were used on each side of the box. trinkets and jewellery in side the box. 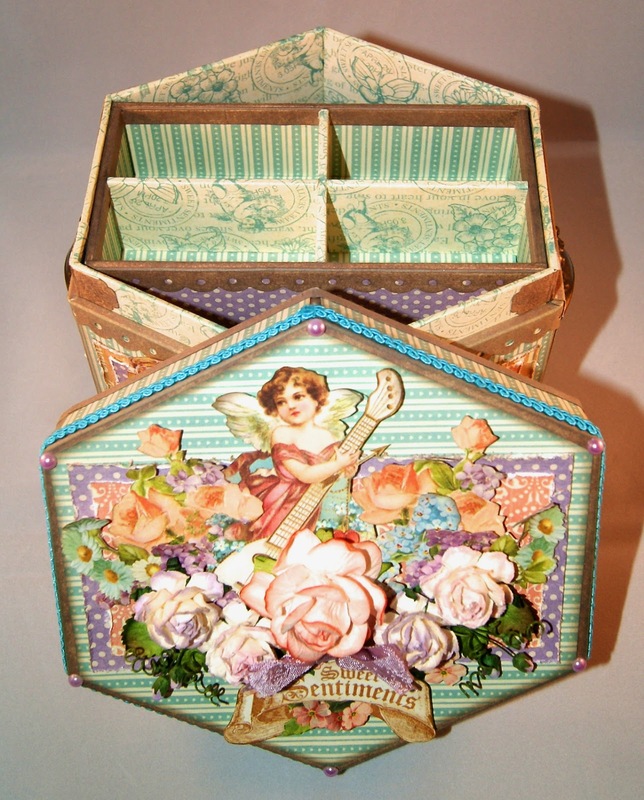 These were made from chipboard as was the entire box construction. weeks to see more of my latest creations. This is a beautiful box!!! thanks for sharing!!! Stunning,stunning creation. You are so talented and deserve your place on G45 team. Look forward to seeing more of your work. I saw your projects today on the G45 blog and just had to visit your blog to see more of your beautiful work. Thanks for sharing your amazing talent! Your box art projects are exceptional and it will be a lot of fun to watch the G45 Team this year and view the creativity. WELCOME ABOARD. Fabulous! You're attention to detail is amazing. So glad I found you. I'm going to send you to my favorites :0) Love your introduction on G45!